Writing this series of articles is taking me on a journey through ancient maps and religious texts… among esoteric writings and myths and interpretations from more recent times… in search of information about how The Seven ethereals or superhumans might have lent a guiding hand to humanity on various occasions across the millennia. If you’re a regular reader, you know that The Seven and their messages are a cornerstone of this website and provide a framework for the afterlife descriptions it contains. And you’re probably familiar with the miraculous contacts that The Seven made to our INIT group, especially through the ITC (instrumental transcommunication) bridge established with our Luxembourg member, Maggy Harsch-Fischbach. This is the seventh time that we accompany and guide you on your progress toward a free, wealthy, and sane future in which humanity would have stripped off the chains of intolerance and cruelty—a future in which it will be able to establish fruitful and durable relationship with the light, ethereal realms of existence…. When they say, “This is the seventh time that we accompany and guide you”… I believe they are addressing us humans of the Second Epoch, which began in Babylon. If that’s the case, then there have been six times since Babylon when The Seven came especially close to our world to help us out. The ITC bridge forged with our INIT group marked the seventh time. During the First Epoch, the age of Atlantis, I believe that ethereal beings and extraterrestrial cultures and the superhumans of Eden and their gifted descendants (the “Titans,” or demigods) all played a more “hands-on” role in human affairs. In fact, I believe it was the bright minds of Atlantis who engineered us modern humans to be the noble-savage creatures we are today. That is evident from many of the murals and stone carvings of ancient cultures that are stored in dusty archives… (which are largely avoided by nervous modern scientists trying to preserve a cracking Newtonian paradigm). 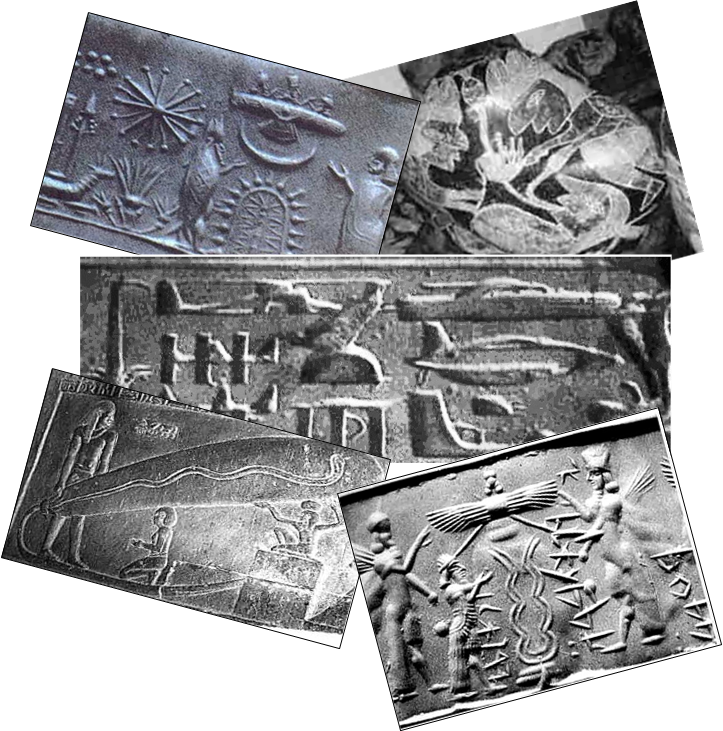 Snapshots from Atlantis (clockwise from top left): 1) Reptilian ET and superhuman observing a hovering craft, 2) heart surgery carved on an “Ica stone”, 3) Atlantean vehicles, 4) probably a portal or gateway to other dimensions, and 5) a large Atlantean light bulb held by a Titan. So, evidence suggests that we didn’t just “evolve from the apes,” which is still the prevailing theory of modern science. We were largely engineered by far more gifted and knowledgeable humans in Atlantis… who no longer walk the Earth in physical form. Some big mistakes were made in Atlantis (what religions have come to call “the fall of man”), and we modern humans, with our short lifespans and noble-savage natures, were apparently delegated to the slow, painstaking task of making things right… restoring the Earth to a paradise environment. Unfortunately, the ITC bridge of our INIT group fell apart amid petty bickering before The Seven had the opportunity to give us more details about how exactly they’ve been interacting with humanity since the time of Babylon. So that leaves us today with the job of studying the messages of The Seven and comparing their reliable, world-changing information to the myths and wisdom of ancient cultures and the insights of bright esoteric thinkers of recent times… and then making educated guesses about how exactly The Seven have been interacting with humanity in this, the Second Epoch. 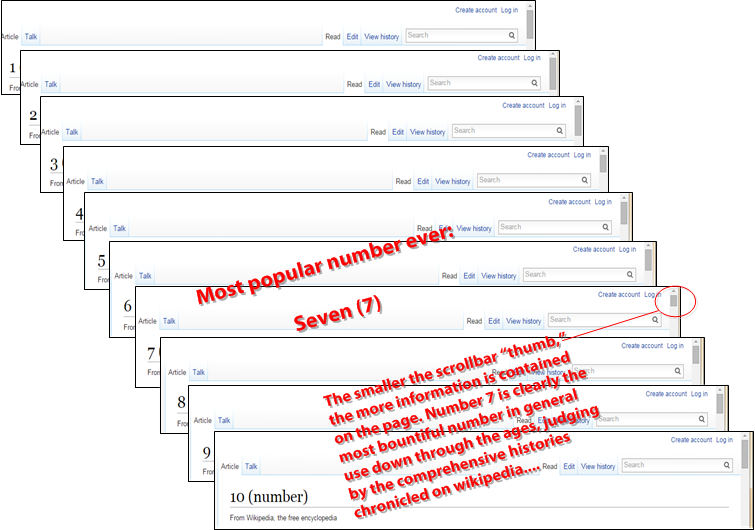 A detailed study of human history would probably show that the number 7 has been the most popular number of all time. We can get a quick snapshot of that hypothesis by comparing the Wikipedia entries about the basic numbers 1 through 10 (see below). All ten of those entries have been compiled by lots of bright researchers exploring all aspects of human endeavor… literature, science, art, movies, religion, myth, and so on… and how each number has played a role. The article on the number 7 is the most extensive, suggesting that it shows up the most throughout the annals of human history. It could just be a bias among a lot of wikipedia researchers toward the number 7, but I prefer to believe that 7 has always been a key number in human affairs… and one reason is probably the impact The Seven have had on humanity. Their influence has permeated all areas of human affairs. That’s the hypothesis I hope to illustrate with this series of articles. … and other significant 7s of history that might (or might not) correlate to “The Seven” powerful beings who came close to our world in the closing years of the Twentieth century to open wide the veil between our world and the worlds of spirit. This entry was posted in Heaven and Earth, Our ancient heritage, Our paradise destiny and tagged ethereal influences on humanity, ITC research, the number 7 in history, The Seven, truth vs myth. Bookmark the permalink. A big project, Mark, that I am sure will yield rich rewards. I have just finished reading Edgar Cayce’s insights on the Revelation, which relates the churches to seven chakras, seven planets and the seven notes of the musical scale, among other things. Thank you for doing the hard work of researching and writing about the symbolism of seven. I expect that it will be a wild ride for you, and I am so grateful that you will share the fruits of all that effort and insight.